Ok, time to sit down and buckle in – we are approaching noon and the finals are going to be coming in very quickly. Before we really start the meet, Dave Hunter got the chance to interview Princeton coach Peter Farrell, asking him on some reflections of his coaching career as this will be his final Outdoor Heps championships. Farrell joked how “117 meets can take a toll on a young man’s body” but it is “a lot of excitement”. 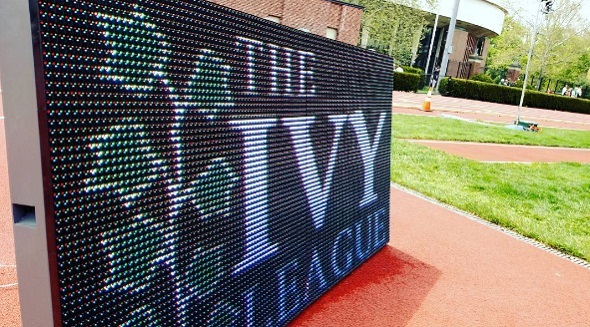 “I watched the Ivy League grow from an all-comers meet to a first Heps meet in 1983… This meet means so much to me… there is no defining moment in a coach’s life,” he shared with Hunter before discussing Princeton women’s perfect score in HepsXC and Cack Ferrell’s determination to outkick rival Yale’s Lindsay Donaldson in 2006 in the 3000m final “as she didn’t want to finish her Heps career seeing the back of a blue uniform,” said the coach. First up – the steeplechase finals. Only nine men are listed in the starting list for the steeplechase final, but they include two Heps champions in this event – Penn’s Nick Tuck and Brendan Smith. Can either of them earn a second title in this event? The field – which includes Yale’s Duncan Tomlin, Cornell’s Connor Herr, and Princeton’s Eddie Owens – will not make it easy. The Penn duo took to the front early after the gun, setting an honest pace as Tomlin and Herr sit in third and fourth, respectively. 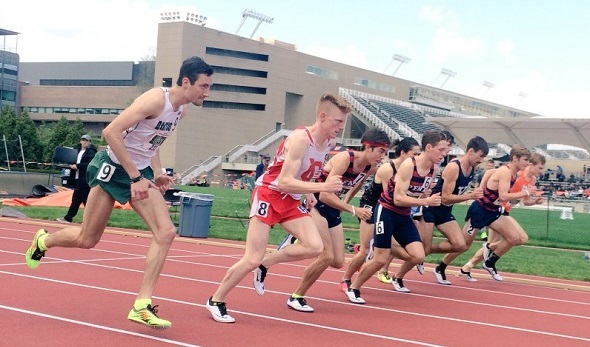 Tuck leads this front four pack as they try to separate from the rest of the field while Owens, sitting in fifth, is about 10 meters behind of Herr (the tail of that front pack). Three laps to go, time 5:22 and Smith took over from Tuck as the leader, but Tuck retook the lead with 2 laps to go as the Quakers began to pull away from the field. Bell lap and Smith passes Tuck with a time of 7:42 and the two Quakers are battling it out. Tuck had a 15m lead over Smith at the last barrier and holds on to claim his second straight title. Smith finished in second, and Owens had picked away from fifth place over the course of the last two laps to ultimately finish in third place. Herr was fourth, Tomlin fifth, and Columbia’s Tommy Rooney snuck in for the final scoring position. The top 5 finishers all ran sub-9:00. The women’s heptathlon completed their sixth event – the javelin throw – and Harvard’s Madison Hansen has retaken the lead from Princeton’s Taylor Morgan as Hansen finished almost 18 feet farther than her. Hansen threw 126-08 to win the javelin while Morgan threw 108-11 for fourth. Hansen now has an overall score of 4643 points, ahead of Morgan (4595), Princeton’s Kerry Krause (4325), Harvard’s Allison Morrison (4231) and Dartmouth’s Allison Frantz (4180) and Maria Garman (4108). The 800m is their final event. The women’s steeplechase is expected to be a battle between the top 2 seeds – Harvard’s Paige Kouba and Princeton’s Emily de La Bruyere – while the dark horse is the defending champion Elizabeth Bird of Princeton. Bird went to the front of the pack early in the race while Kouba waits on her outside shoulder. 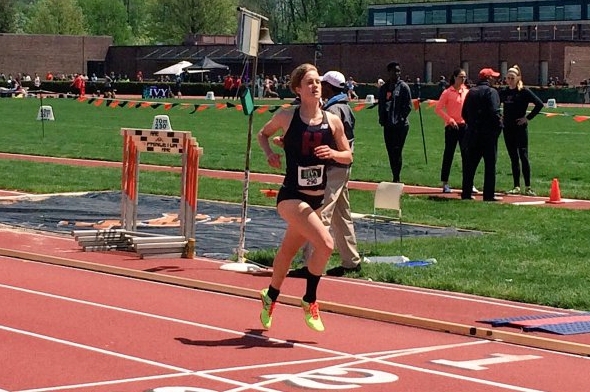 Bird is racing the steeplechase for the first time this season after coming back from a stress fracture. Bird is pushing the pace, running 2:11 after 1.75 laps (82 second full lap – 10:20 race pace). de La Bruyere is in third, followed by Columbia duo Leila Mantilla and Erin Melly. Bird, Kouba, and de La Bruyere slowly pull away from the rest of the field as they formed a 50m gap (6:13 race time) over Penn’s Amy Darlington (4th place), who leads an 8 athlete chase pack. With two laps to go, Kouba and de La Bruyere began to pull away from Bird as they increased the pace to a 79 second lap, Kouba leading about about 2 steps. At the bell, Kouba has about a 5m lead over de La Bruyere (time around 8:50) and Kouba picks up the pace. Bird remains in third while Princeton’s Alex Markovich moved into fourth. Kouba extended her lead and has a clean final lap to hold on for her first Heps title in 10:04.52, while de La Bruyere and Bird go second and third. Darlington outkicked Markovich for fourth place in the final 100m. Kouba will return for the 1500m final within the next hour, while de La Bruyere is scheduled to be in the 5000m final later today. The women’s heptathlon began their final event with the conclusion of the steeplechase. Princeton’s Taylor Morgan would need to beat Harvard’s Madison Hansen by over 3 seconds if she wants to claim the overall title. But Hansen went to the front of that 800m, running a 66 second first lap to try to keep the gap over Morgan (perhaps with ideas of NCAA qualification in mind?) Hansen makes it back-to-back heptathlon titles, running 2:15.43 for the 800m to secure her win in a new meet and conference record. 1. Madison Hansen (Harvard), 5530 – new meet and conference record! The men’s 4×100 relay was going to be a battle between Cornell and Princeton, and it did not disappoint. 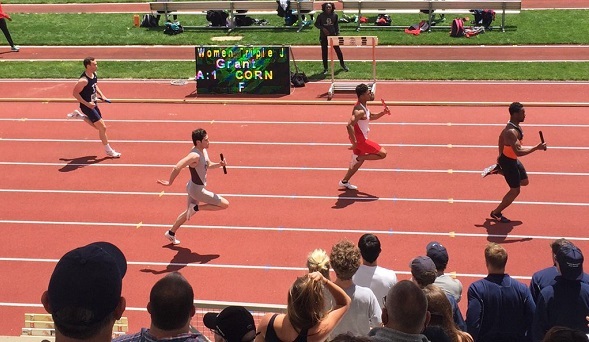 The anchor legs – Carrington Akosa and Zach Menchaca – had a great battle on the final leg as Akosa got the baton before Menchaca by only a few steps (shown in the Brian Tompkins image below). But Akosa held onto that lead to get the win for their first 4×100 relay win since 2000. The women’s 4×100 is going to be Harvard against the clock to see if the Crimson can reset the meet record. But Cornell kept the race tight through the first two legs but the Crimson third leg pulled away to secure their win. They beat the clock, running a new meet record of 44.85. This entry was posted on Sunday, May 8th, 2016 at 10:56 am. It is filed under Heps Champs, Spotlight. You can follow any responses to this entry through the RSS 2.0 feed.